An overhead view of the scene of a shooting in San Francisco's Hunter's Point neighborhood on Friday December 30, 2016. 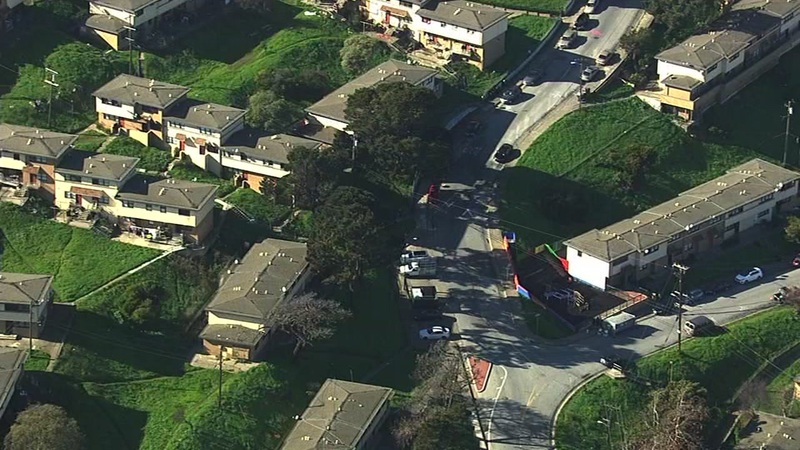 SAN FRANCISCO (KGO) -- Police are searching for a teenage boy accused of shooting a woman in the face when she answered a knock at her door in San Francisco early Friday morning. The shooting happened on Northridge Road near Harbor Road in San Francisco's Hunter's Point neighborhood before 1 a.m. The 32-year-old victim was expected to survive her injuries. The suspect was described as a teenage male between the ages of 15 and 18. Investigators say the woman didn't know the gunman.